In the run-up to next Sunday’s German Bundestag election, there is much speculation about the anticipated low voter turnout. One of the commonly cited reasons for the dwindling willingness of voters to cast their ballots is because the main political parties do not differ, positional, in their political programs. How true is this assumption? The most comprehensive presentation of the policies parties favor can usually be found in their electoral manifestos, sometimes called ‘election programs’. An analysis of these manifestos shows that political competition in Germany is actually not as bleak as is often claimed and that the parties actually do differ in their stated policy positions. As already described in a previous blog post, three decades ago the Manifesto Project took up the task of analyzing parties’ policy positions as stated in their electoral programs. In this framework, we took a closer look at the manifestos of the five parties who are most likely to win parliamentary seats in Sunday’s election. On the basis of these results we are able to describe which policies and issues are at the heart of each party and where the parties are located on two key dimensions: economic and social. Using this information, we can show where the parties are similar and where they differ. The first graph maps where the five parties are located on the two dimensions. 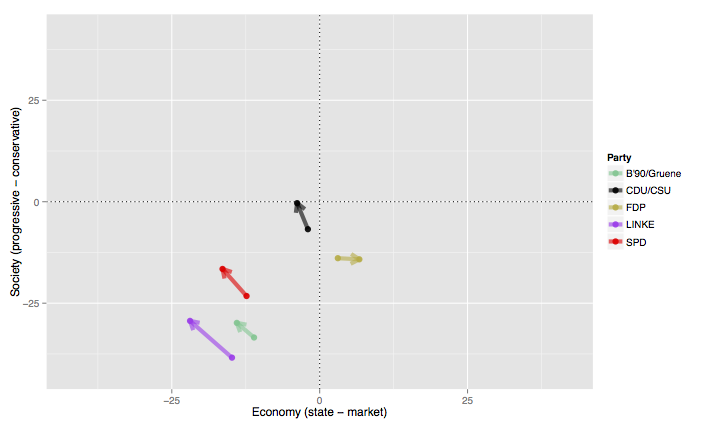 The horizontal axis shows how the parties are placed with regard to economic questions. The end point on the left side (-100) denotes an extreme version of state controlled economy and the end point of the right side (100) stands for the total removal of the state from all economic concerns and preference for the sole reliance on market forces. None of the five German parties takes one of these extreme positions. Nevertheless, there are clear differences. We can indeed distinguish the five parties into two camps: the CDU/CSU and the FDP on the right side and the SPD, GREENS and LEFT on the left side. In contrast to the 2009 economic positioning of the five parties, we see that these two camps are much less distinct in 2013. Furthermore, we can see that all parties – except the FDP – have moved to the left on the economic dimension compared to 2009. Also interesting to note is that the FDP is to the right of the CDU/CSU on economic questions. The vertical axis of Graph 1, then, shows the parties’ positions regarding social questions, separating progressive from conservative worldviews. The higher up a party is located on this axis, the more conservative its position. Conservative positions are, for example, the endorsement of law-and-order policies or traditional stances towards moral questions like abortion. The protection of the environment, peace and social equality, on the other hand, are progressive positions. The positions of the five parties on this axis are markedly different than on the economic axis. Instead of two camps, we can now distinguish three: SPD and FDP are close, as are the GREENS and the LEFT, while the CDU/CSU is alone in taking the most conservative position. Again, the comparison to 2009 is once more interesting. We saw that, concerning economic positions, all parties excepting the FDP moved to the left. On the social axis, however, all parties moved up, i.e. became more conservative. The only exception is, yet again, the FDP that does not change its position regarding social policies in comparison to 2009. 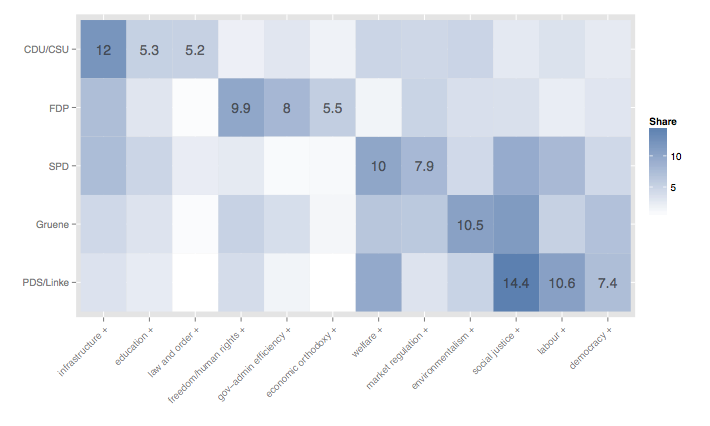 In addition to analyzing the positions on these two abstract dimensions, we can use the data to say something about the salience of single issues. Such an analysis shows us that, contrary to urban legend, the parties do have different profiles and are emphasizing different issues in their manifestos. In order to investigate these differences we now look at the “light house” issues of the parties. These issues distinguish the parties from each other, i.e. they are those that are emphasized considerably more often by one party in comparison how much the issue is stressed by all the other parties. It is important to note that these “light houses” are not necessarily those issues emphasized most often by this party within their own manifesto. The key distinction is that these issues are emphasized more often by this one party than by all the other parties. There is one limitation to this rule: for this analysis we only included issues which were important enough for at least one party to spend 5% of their manifesto discussing it. Graph 2 shows the share of statements for each party’s “light house” issues within their respective manifesto. What becomes obvious at first glance is that the parties emphasize those issues in their manifesto that they are also associated with in the general political discussions. For the CDU/CSU, there is a special emphasis placed on the issues of technology and infrastructure. The CDU/CSU emphasizes technology and infrastructure double the amount of the SPD and FDP, while the LEFT and the GREENS do not emphasize this issue at all. Indeed, it is the issue the CDU/CSU talks about most often in their manifesto. The other issues where the CDU/CSU differs from the other parties are the expansion of the education system as well as the stressing of ‘law and order’ policies. The CDU/CSU is, indeed, the only party emphasizing ‘law and order’ policies. In contrast, statements supporting the expansion of the education system are also strongly emphasized in the SPD manifesto. Our analysis also points to three issues that are more important to the FDP than to the other parties. First is freedom and human rights where the emphasis found in the FDP manifesto is unparalleled by the other parties’ manifestos. Second, the FDP stresses its approval of governmental and administrative efficiency and here the gap to the other parties is even bigger. The third issue, where the FDP stands out from the other parties is in their strong emphasis on economic orthodoxy. Turning to the SPD, the party clearly stresses two issues more than the other parties do. First, 10% of the SPD manifesto is devoted to statements supporting the expansion of the welfare state. Not only is this issue a “light house” issue in comparison to the other parties, but it is also the issue most emphasized by the SPD. Welfare state expansion is also an important issue for the LEFT and the GREENS but it plays a slightly lesser role in their manifestos. Market regulation is the second light house of the SPD when compared to the other parties. For the GREENS, we only see one light house issue that is, perhaps unsurprisingly, environmental protection – the quintessential green issue. Statements supporting environmental protection have a far bigger share within the GREEN manifesto than in any other manifesto. However, simply because there is only one dominant light house within the GREEN manifesto does not mean that the GREENS do not emphasize other issues. For example, the issue with the biggest emphasis within the GREEN manifesto is actually social equality. However, the LEFT is stressing social equality even more. This leads us to the issues emphasized by the LEFT party. In addition to the aforementioned LEFT “light house” social equality, the LEFT party also emphasizes issues favoring labor groups and their rights as well as democracy. Democracy is another issue which the LEFT stresses just a bit more than the GREENS. Labor groups are also an important issue for the SPD, the difference in emphasis to the LEFT are, however, clearer than between the LEFT and the GREENS in the case of democracy. In conclusion, we can say that the parties are clearly representing different positions in the 2013 election of the German Bundestag and are having clearly differentiable profiles – at least in their manifestos. Dieser Eintrag wurde veröffentlicht in Bundestagswahl 2013, English posts, Manifesto Project von Sven Regel, Annika Werner, Pola Lehmann und Nicolas Merz. Permanenter Link des Eintrags.